Syracuse head coach Jim Boeheim looks on during the first half of an NCAA college basketball game against Notre Dame , Jan. 5, 2019, in South Bend, Indiana. Syracuse won 72-62. Authorities say the pedestrian got out of a car that had crashed on the highway in Syracuse. 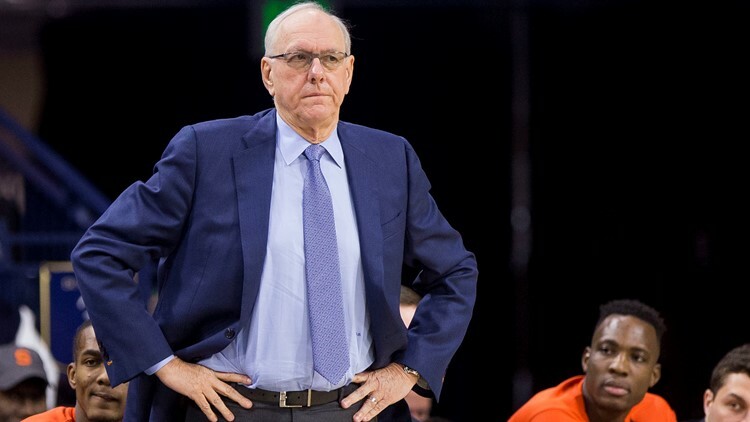 SYRACUSE, N.Y. — Longtime Syracuse basketball coach Jim Boeheim struck and killed a man standing along an interstate late Wednesday night as he tried to avoid hitting the man's disabled vehicle, police say. "He stopped immediately and exited the vehicle," said Syracuse Sgt. Matthew Malinowski. Just hours before, Boeheim's team defeated 18th-ranked Louisville 69-49 at the Carrier Dome. The accident scene is between the dome and Boeheim's suburban home. Police could not confirm if he was on his way home after the game. Syracuse University director of Athletics John Wildhack said in a statement the university sent its condolences to "all impacted by this tragic accident." Wildhack echoed police, saying Boeheim "is in contact with local authorities and cooperating fully."